Christmas may be over, but there's still such a festive, wintery mood everywhere. 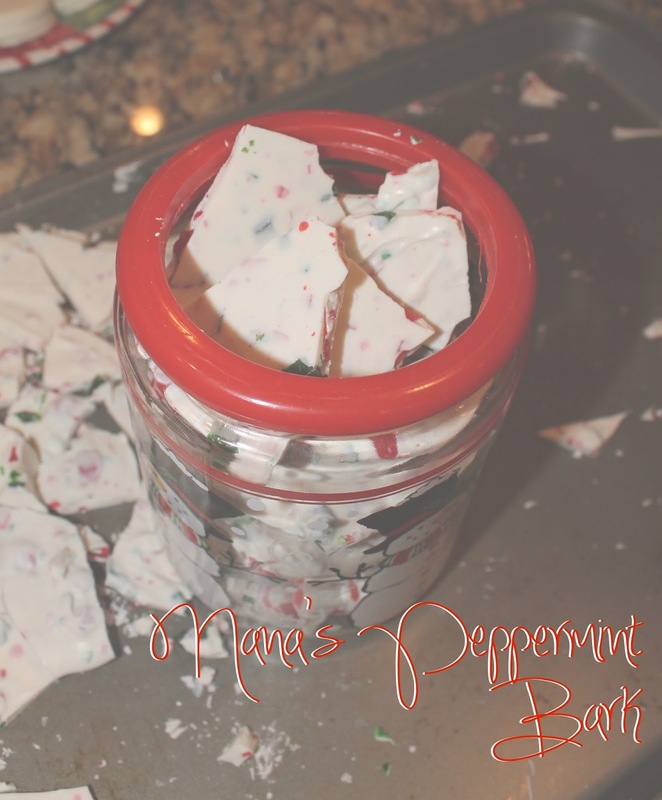 One of my favorite treats during the holiday season and wintertime is the peppermint bark my grandmother (we call her Nana) has made for as long as I can remember, and today I'm sharing her recipe with you! All you'll need for this is a one-pound bag of white chocolate, a one-pound bag of peppermint pieces (or crush the peppermint yourself, you do you), a cookie pan, and a big bowl for mixing and melting. The first step is to melt the chocolate. Put it all in your bowl and microwave for 30 seconds. Stir and repeat until it's smoothly melted with no chunks. Then you get to add the peppermint! This is subjective and you can put as little or as much as you want in your melted chocolate. We put in about half the bag and stirred. After mixing in your peppermint, spread it all out on a cookie pan. Don't spread it too thick or thin (about a half inch) and know that it doesn't have to cover the whole pan. Pop it in the freezer for about thirty minutes and let it harden. After taking it out of the freezer, take the end of any utensil to break up the chocolate into pieces. And you're done! This is a great little treat to munch on or is a great little gift. I know I'll be eating some right up until New Year's.